This is my ﬁrst time reading anything by author, Emily P. Freeman. 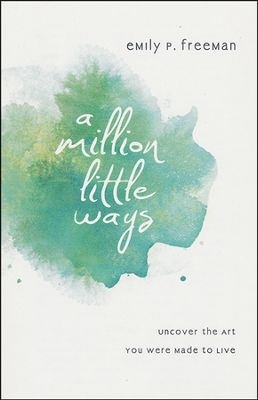 I have so enjoyed A Million Little Ways. Within the covers of this book, I found words that made me realize each one of us is truly born with a longing and a need to be creative. Each of us has an art, hidden inside of us, waiting to be developed and shared with those around us. In Part 2, Emily encourages us to look with, look back, look up, look around, and look beneath in order to discover the art we were born to create. In so doing, each of us will ﬁnd the way in which our lives will declare the glory of God. By the time I closed the covers of this book, I came to embrace that my life bears Godʼs image and He has chosen to reveal Himself in my life using creativity that is unique to me. I found myself with a renewed sense of who I am and what I am meant to do. This book is a must-read for everyone, but especially for those seeking to ﬁnd the courage to be all that they are in the deepest part of their soul. Joanne Viola will be celebrating my 35th anniversary her my husband this May. She has two children who are both now married. She is also "Mimi" to two granddaughters whom she watches while their parents work. She loves Jesus, God's Word, people, reading, and several cups of coffee to start my early mornings. Since discovering blogging, she loves to share her days and thoughts with others on my own blog, Days n Thoughts.